The 2017 Gippsland Business Awards process, the Awards evening, congratulations to the winners, thanks to the GBA committee and suggestions for next year’s Awards. On Time Typing, finalist in the Business and Professional Services section, was represented by myself – Sally-Anne Watson Kane, editor – and Rae Desmond, transcriptionist (both pictured above). We were accompanied by Rae’s daughter, Shari McPhail, Victorian State Manager of Community Housing Ltd, a Registered Housing organisation managing over 2000 properties across Victoria and homelessness services in Gippsland and the Eastern region. Thank you, Rae and Shari, for sharing this celebratory evening with On Time Typing. 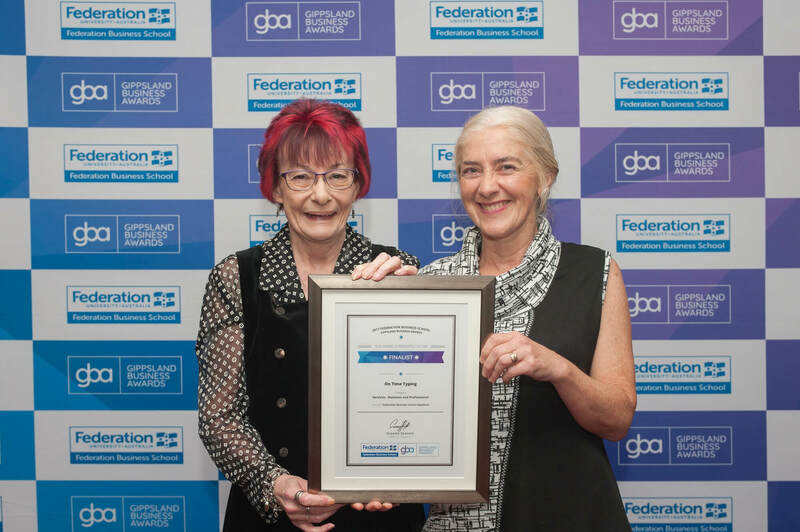 The 2017 Federation Business School Gippsland Business Awards gala evening on 25th August at the Premier Functions Centre, Traralgon opened with a welcome by MC Denis Walter and speeches by the GBA Committee Chair and Federation Business School representative. This was followed by the presentation of awards; some great singing and dancing by Oz Boyz: Australia’s Boys of Motown; then the last half of the award presentations. A three-course dinner and plenty of wine and beer were served throughout the evening which celebrated the achievements of all finalists as well as the winners of the 2017 Awards. Oz Boyz were an excellent choice of entertainment for an audience whose age-group spanned three generations. The Boyz danced, sang and lip-synced to a huge variety range of songs dating from the 1950s to the most recent hits of 2017 which everyone enjoyed – as evidenced by the extent to which the audience joined in, regardless of their age. On Time Typing is very happy to have been a finalist in the 2017 Federation Business School Gippsland Business Awards, in the Business and Professional Services category. 2017 Business of the Year: Aussie Broadband. Thank you to the 2017 Federation Business School Gippsland Business Awards Committee: Chair, Graeme Sennett; Secretary Leo Billington; Treasurer Pat Coles; and Committee Members: Stephen Breheny, Janine Hayes, Kelly McCarthy, Leonie Paulet, Patricia Reardon and Stephen Riess. Inclusion of an award for Aboriginal and Torres Strait Islander businesses in Gippsland. I look forward to seeing you again in 2018!